The Cartoon Fiend: Friends of the Fiend 16: Dee Adams. DA. Hi Fiend, thanks for asking me to be a part of such a great group! I always feel like I'm an imposter when I get around professional cartoonists! DA. I'm trying to finish my first Minnie Pauz book, but I've been working on this for about 6 years so who knows if it will finally get done. DA. Becoming a cartoonist (or an imposter cartoonist) was a complete surprise at about 49 years of age when I got the idea for a menopausal cartoon character. DA. 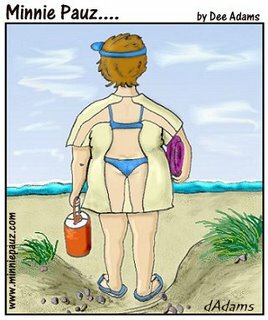 My cartoon has grown into a business, Minnie Pauz Enterprises, so I actually spend more time working on my website and marketing than I do on cartooning. 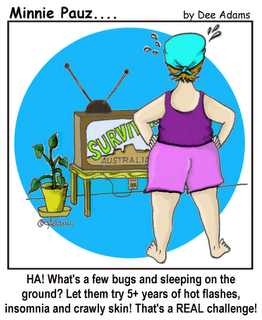 By promoting my cartoons to the appropriate market online, I have developed a following and created a community where women can discuss midlife concerns and share experiences. The large following, 15,000 subscribers, and top-ranking in the search engines has attracted advertisers and sponsors who are scrambling to reach this huge market segment, which has allowed me to make a living entirely from cartooning. No one is more surprised about this than me! Interested in subscribing to the Minnie Pauz newsletter? Click here. DA. Very simple. I do a pencil sketch on copy paper, ink it with a Zig calligraphy marker, scan it and color it with PaintShop Pro. (still haven't learned to use PhotoShop with any skill). I save a high res copy for future use (in books or presentations) and have a low res jpg or gif for my website. When I first started though, I was in such a hurry to get a new cartoon on the website, I would forget to save a high res copy and now I have to find the original, rescan it and color it from scratch when someone wants to use certain ones. DA. I believe that anyone who has a creative thought and produces something tangible is an artist, so that would absolutely include cartoonists. The fact that cartoons have come through history as a form of self - expression, as a learning tool and as entertainment, tells me without a doubt they've had incredible cultural impact on society. DA. 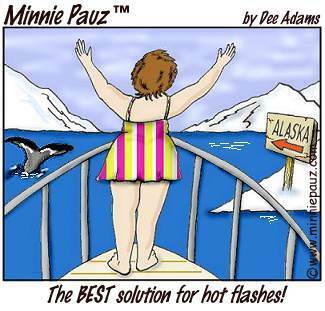 I would like to do Minnie Pauz as a strip, in addition to the single panel format. It's on my "too learn" list. DA. I didn't really have any until I ended up on the Wisen, looking for help on how to draw cartoons and how to market/price my services. Getting advice from some of the successful cartoonists on there has been a blessing. DA. I don't have a favorite, but I tend to study the women and their road to success in this business. DA. The internet has actually created my life as a cartoonist and I will be forever grateful. Get your Minnie Pauz goodies here. DA. 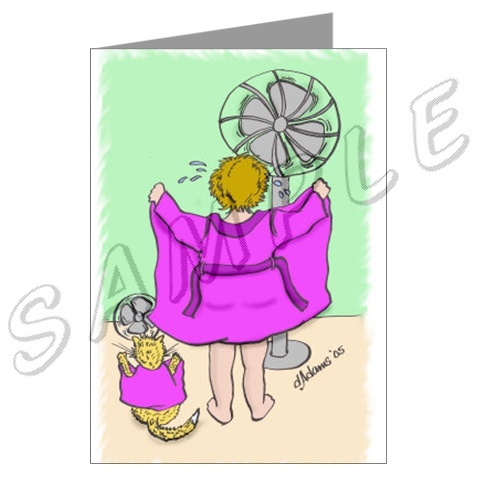 I wouldn't mind having Hallmark wanting me to start a complete line of Minnie Pauz products! DA. Thanks for the opportunity to be here!